Not really sure fun is the right word but its certainly been an eventful year. So, I last left the blog with, I’m writing my next book, bob and no hope spring to mind. Not sure why but the moment I stopped working I appeared not to need to write. One assumes that working with some first class twonks was the reasoning behind my at times rather random ramblings. I have been asked to write by a few, Mrs P to name one and probably there are a few that have sighed a breath of relief they haven’t ended up being featured in my blog or next book….all I will say is yet! I am still Frazzled, still have cancer and really not 100% sure what I am actually doing, I’ve managed to flounce about for the last year, dabbling in a bit of this and that, becoming a jack of all and master of none. I hit my 2 year diagnosis anniversary this month, it made be take a quick look, friends have come and gone, new ones popped up and thankfully some of my old faithful’s are still there. Its amazing how someone you’ve known for years suddenly appears to think cancer is contagious, people are strange. Frazzle Towers is still standing, just… I put that down to being sort of Emo less, I rehoused Big E in a house share not far from FT, thought it was time he moved out and became independent, well at least do his own washing for a start. Muggle & Lil are both away at University and apparently enjoying the party life, well Lil is for sure…. The Frazzly animals are all still going, Bert the boxer has canine dementia, shouldn’t laugh but boxers are mad, add in dementia = recipe for disaster, more of that perhaps another day. Frazzly Dad unfortunately went to the big cream bakery in the sky in January, we all miss him terribly and life isn’t quiet the same without him. I like to think he is still causing mischief up above and long may he continue to do so. We are now the owners of a motorhome, nope I wouldn’t have put us down for that one either… However with rather a lot of free time on our hands, well I have, Mr F is still competing in triathlon’s, and Bert having dementia, meaning we cant really leave him it made sense, well sort of. So Geronimo (the motorhome) is now part of the Frazzle household, its rather like Frazzle Towers on wheels and glamping on wheels, just minus the Emo’s and most of the animals, more about that another day. As with everything here, its been eventful, as yet we haven’t been banned and I could probably write a book about our travels so far. The one good thing, Mr F hasn’t been in the fridge or cupboards and arranged everything in date order, one assumes that’s to come….. There is one event that has always captured my imagination since it started when I was 13 years old back in 1981 and that was the London Marathon. My English teacher at the time ran the very first one and I can still remember the awe I felt in not only him running and completing it but the fact that he turned up the very next day in school. As time has gone by the last few weeks I had a question that I needed answering, how can I further integrate by training and goals (and eventual goals) with the fund raising for MPN Voice, running 5k and 10k races and more triathlons (upping the distances) was the obvious answer and this will happen over the next year or so but I needed a larger stepping stone that wouldn’t be too far in the future. Ive been promoted to coach! With the block of Swimming lessons I had been having coming to an end last week I was looking at making Tuesday my day off. Little did I know Coach M….sorry I mean Mrs M, had a little plan up her sleeve, Yoga. Always eager to help me in any way possible Mrs M having heard about the benefits to Triathletes of the art of Yoga had sourced a local class to attend. I was a little apprehensive as Mrs M explained that it was at the local WI hall and although being advertised as both a male and female class the only other male had been to last weeks class for his first time but there was no guarantee he would turn up this week….I could be the only male present. 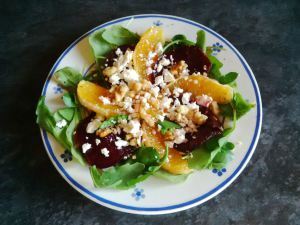 As you must all aware of by now as part of my regime since last August is to eat healthier so I am always on the look out for tasty offerings and at the weekend came across a nice light salad which utilizes the well publicized nutritional goodness found in Beetroots, Walnuts and Oranges and can either be served as a side salad or as a main meal when served with warm crusty wholegrain bread. And you have to agree it looks great (thanks to Mrs M), especially at this time of year….enjoy. Today should have been a double header with strength training this morning, getting up at 5am to do an hour before work, and a run tonight. But it was swimming last night, 450 metres in the lanes first then a lesson of 45minutes. The clever person would have had a little warm up first then the lesson but unfortunately this is me we are talking about and I cannot resist the urge to put the laps in during my new found love of swimming so 750 metres later…. When I finally got home at 8.30pm, had a quick bite to eat I was left shattered. To bed at 10pm, forgot to set the alarm, which isn’t normally a problem as I normally wake with the dawn chorus at 4am, not today no today Andy was shattered and late up. Having ridden out Friday night on a new route….the conclusion reached was that I will not find a route in our vicinity ‘hill less’, more to the point a route that will enable me to stay in zone 2 longer than 5 minutes. This is obviously causing me problems as I am still trying to build my base. it was purchased and set up all in time for my scheduled Saturday evening ride…did you expect anything less? One hour later with a vast puddle of sweat around the bike I sat there exhausted…but content…I think its all finally starting to come together. I’ve been a car driver for 29 years and have always treated cyclists in a courteous manner….not without exception admittedly. In those years I have seen both cyclists and car drivers act in brainless ways. But since becoming a born again cyclist as well as a motorist I cannot deny a new perspective has been opened up to me. There are as equally bad motorists out there as there are bad cyclists out there…fact. Cyclists…don’t jump red lights…signal your intentions at junctions…don’t mount pavements at speed endangering pedestrians. Motorists…give cyclists plenty of room…remember pot holes are the cyclists biggest enemy…and afford a little patience going up hills. We all have to use the road, no one has precedence over the other. As I said in an earlier post, in August 2013 I weighed in at a whooping 14.5 stone. It was the culmination of years of over indulgement at a well known high street bakery (the wife Rhiannon often jokes that takings must be down), local cafes and just generally food abuse with little or any exercise. In my younger days I had always carried a little as they say but since the age of 40 it had steadily been piling on.